What is duration of the courses? If not stated otherwise, all courses runs for 6 days in total with 30 to 35 hours of instructions. What is the number of participants / group size? There is a maximum intake of 10 students for each training program to ensure a high level of student-teacher interaction. 6.30 – 7.30: Flow in Stillness Movement and Meditation practices (optional depending on course) 7.30 – 9.00: Free time for breakfast 9.00 – 12.00: Morning class (usually with a shorter break) 12.00 – 17.00: Free time to explore island 17.00 – 19.00: Afternoon class. The optional morning practices are complementary and we highly encourage your participation. What time does the program finish on the last day?The last day of all courses are scheduled to finish at 12.30pm. Please arrange your travel plans accordingly so you won't have to leave early. How do I apply for a program?For Shima Healer Within and Singing Bowl Foundation Course please download the application provided at the respective program section, fill it out and send it via email to info@shima-healing.org. For all other courses just send us an email. Students registering for the first time, must submit their application form at least 3 months prior to the commencement of the program. For practitioner training programs, two letters of reference are required. What is the difference between Shima’s Retreats to the Practitioner Courses? Our pilgrimage retreats are designed to help you understand the modality you are learning, as well as to immerse yourdself in the culture where the respective healing art came from. What are the taxes and service charges for Shima courses: Included in the price of all orders is 7% VAT (shown on bill), as well as a 4.4% Paypal processing fee and a 3% web system handling fee. Why do I need to fill out a Student Information Form when I register? As the courses are in high demand, we use a student information form in the registration process which enables us to understand more about you, and helps us to select the most suitable candidates for the training. All personal data you supply to Shima Healing via this form will be treated confidential and not be forwarded to any other person and / or entity. Do I need to be physically fit to participate? There will be some climbing up and down of big steps at some of the accommodation sites and morning movement classes. Please let us know if you have any health concerns so we could advise the best options prior to the start of your course. What is the difference between Shima Healer Within and the Practitioner Training Program? Shima Healer Within is our foundation course for self-healing and personal development, It is a open to non-practitioners. If a student has never meditated or practiced self healing work previously, this course is a prerequisite. The practitioner courses are for students who have been using the respective technique for some time already. What are the differences between the Shima Healer Within Core Program and the Specialised Program? The Core Program imparts the basic understanding and awareness in energy, sound and movement for self-care. In the Specialised Program, the student acquires a deeper connection and command of a chosen area of healing - sound, art, movement, mediumship etc. for self-care. This Program is available once a year and is listed within the Shima Healer Within calendar. Will I need to purchase singing bowls and other healing tools? This is not compulsory. However, we highly recommend purchasing a singing bowl and a tingsha during your program so you can have your own personal self-healing tools for learning and for daily practice after course completion. Should I tell you about my food allergies? Please let us know in advance if you experience any food allergies (eg. peanuts, dairy etc.) – a cooking class is included in the Shima Healer Within™ course. Do I need to bring my own singing bowls? Only if you wish to. All the necessary tools will be provided during your training course. Why should I take a Practitioner Training Program more than once? Mastery requires years of committed practice. Upon completing a course the first time, a student is able to have a general understanding and grasps the mechanics of the modality. After practicing and gaining hands-on experience for some time, then taking the course for the second time, a student is able to gain deeper insights and intricacies of the healing modality. Mentoring the students to cultivate embodiment of their chosen healing modality is a commitment the Shima Healing Institute places great emphasis on. Will I need to sit any exams or tests in order to complete a course? Yes. All students of any Practitioner Training Programs are required to pass a written and a practical exam for course completion. What should I expect after completing the course? All Practitioner Training Program graduates of the Shima Healing Institute have access to the Shima global healing network for opportunities to practice in different countries across the world. Why can’t I take all of the levels at once? The true teaching of the healing arts is imparted from life, not from courses and programs. Time and dedication are paramount for integration and learning of the wisdom held within different facets and levels of each healing modality. Do I need to start from the Singing Bowl Foundation Course / Reiki Level 1? Yes, all students must start with Foundation / Level 1 as this sets the foundation for the other, advanced levels. Even if you learned the subject before / at a different school you have to advance through the Shima stages as there is always room to improve and / or review the basics. What type of visa will I need? There are two main types of visa for travellers. The first is a “visa free” stay of 30 days. The second is a tourist visa valid for two months, which you’d need to obtain from your country of origin prior to entering Thailand. Both can be extended from within Thailand. As the visa conditions are different for different nationalities, we recommend consulting your nearest Thai embassy or consulate for the latest information. A comprehensive guide on Thai visas can be found here. Which airport is the best for getting to Shima Healing? Phuket Airport or Krabi Airport are nearest. The total travel time from either airport is about the same. Arriving from Krabi will land you at Tha Khao pier, which is within walking distance (10 minutes) of Shima Healing. How do I get to Shima Healing? FROM PHUKET: From the airport take a taxi to Bang Rong Pier, it takes approximately 25 minutes (600 THB). Or, if you are departing from Old Phuket Town, local buses leave every day from the market to Bang Rong Pier. Bus Departures: 8:30 | 9:30 | 10:30 | 11.30 | 13:00 | 16:00 (THB 40) You can also take a tuk-tuk to the pier for about THB 400. Catch the ferry to Koh Yao Noi’s Manoh Pier. Speedboat takes around 30 minutes (200THB per person). Long tail boats takes around 1 hour (120THB per person). Speedboat Departures: 7.30 | 8.30 | 9.40 | 11.15 | 12.30 | 13:15 | 14:30 | 15:00 | 16:00 | 17:00 | 17:30 Once you arrive on Koh Yao Noi, there are always many local taxis available for hire from Manoh Pier. The journey from the pier to Shima Healing Centre takes approximately 20 mins (150 THB per person). FROM KRABI: Taxi from Krabi Town or Krabi Airport to Thalen Pier is the quickest option. It takes about 45 minutes from the airport (700-800 THB). From Krabi Town, you may also take the bus from the local bus station (5 km outside Krabi) or in front of Voda Supermarket. Bus Station Departures: 9:00 | 10:00 | 12:00 | 15:00 | 16:00 Voda Supermarket Departures: 9:00 | 10:00 | 11:30 Ferry to Koh Yao Noi’s Tha Khao Pier. Speedboat takes roughly 30 minutes (THB 200) and long tail boat around 1 hour (120 THB). Ferry Departures: 9:00 | 10:00 | 11:00 | 13:00 | 14:00 | 16:00 | 17:15 Once you arrive at Tha Khao Pier, walk to Shima Healing from the pier in 10 minutes. What preparations do I need to make before departing for Koh Yao Noi? There are few banking facilities on the island and most businesses accept cash only. Although there are ATMs on the island, sometimes they don't work so we suggest to come prepared and withdraw some cash before leaving Phuket or Krabi. What is the currency in Thailand? The currency in Thailand is Thai Baht (THB). What voltage is used in Thailand? The voltage in Thailand is 220 volts. Where is Koh Yao Noi? Koh Yao Noi is a small island in the south of Thailand. It is located in Phang Nga bay, almost equidistant from Phuket, Phang Nga and Krabi. What is the weather like On Koh Yao Noi? Koh Yao Noi is warm all year round with temperature ranging between 26oC to 35oC. November to February is relatively cool, the sea is flat calm and there’s very little rain. During March and April the weather gets progressively hotter until May, when the rainy season begins. May to August is usually sunny with occasional big tropical downpours. There is normally a lot of rain during September and October and can often rain for days at a time. What is there to do on the island? Kayaking and snorkelling There are dozens of tiny islands surrounding the eastern shorelines which makes very picturesque ocean exploration. Kayaks can be rented for about B300 per day. Most hotels and travel agents sell kayaking and snorkeling trips to Koh Hong and other islands in Ao Phang Nga. Cycling Cycling is a growing sport on the island. The quiet island has many smooth secondary roads with very little traffic where one can visit fishing villages, local shops, markets, rubber plantations, farms and gardens. There are also plenty of trails, ranging from easy to challenging. There are two hills on the main ring road on the island of Koh Yao Noi. Local maps are available upon your arrival to the island. Cultural exploration Shima Healing offers many opportunities for its students as well as travellers to experience the local village culture on Koh Yao Noi. Some activities include Batik painting, Thai massage, Thai cookery course and local village tours. During briefing on the first day, you will be provided with activity information to provide you a wonderful experience of the island to accompany your course. Restaurants in the village and around the island There are a small handful restaurants in Tha Khao village pricing budget to medium-range. Mostly Thai local cuisine but some organic cafe and Italian pizza/pasta options are also available near the village. How do I get around the island? There are taxi services available on Koh Yao Noi. You may also rent a mountain bike or motor scooter to explore the island. All transport options can be easily arranged by your resort/hotel. Can I use credit card on the island? Larger resorts accept credit cards. Most businesses on the island can only accept cash. Is there currency exchange or banks on the island? There are two banks available on the island. There is an ATM machine in the village where Shima Healing is located. A Yob Shop at the pier has yellow coloured ATM machine. There are also a handful of ATMs on the island in various locations but sometime they do not work. We recommend withdrawing some cash in either Phuket or Krabi before departing for Koh Yao Noi. Yes. Koh Yao Noi has been relatively untouched by tourism compare to other places in Thailand like Phuket/Aonang and is a quiet and friendly island. Are there local customs I should be sensitive to? Koh Yao Noi is a Muslim island and the islanders are keen to preserve their traditional ways. It is important to respect the local culture by dressing modestly and refraining from drinking alcohol outside of the facilities catering to visitors. Animals As with all Muslim regions, pork and dogs are not tolerated - please leave your pets at home and refrain from bringing pork items into the village. Attire Shima is located in the heart of the Tha Khao village in front of a village mosque. Please wear modest clothing that covers both your shoulders and knee when around the village. Ramadan (May/June) During this time, local families break their fast daily by gathering after evening prayer. Please be mindful of this nightly ritual, as restaurants may close for about an hour at sunset and reopen later on in the evening. Does Shima Healing provide accommodation? While the courses offered at Shima are non-residential, there are a number of accommodation options. Please see below a list of recommended lodging for your time at Shima Healing. All stays can be arranged by yourself directly with the bungalow or resort of choice. Can Shima Healing arrange accommodation for me? We do not provide booking services. However, once booking has been made, we would be happy to confirm your booking with bungalow on your behalf. Do I need to pay in advance for accommodation? Payment terms are determined by each bungalow/resort or your chosen booking platform. Most bungalows on the island only operate on a cash basis upon check-in or check-out. Kindly check directly with your chosen place of accommodation. Can I share a room with other students?All courses offered at Shima Healing require in-depth self-reflection outside of contact hours. We recommend staying alone to receive maximum benefit and learning from your course. I will be coming with my family, what is the best way to arrange accommodation? It is recommended to have your own room if possible, to allow for require self-reflection time and inner practice. Shima Healing is located in the village Ban Tha Khao on the eastern shore of Koh Yao Noi. Despite a rather steep climb to bed this is one of the most amazing bungalow operations on this island. Delicious food and great hospitality! The bungalows are on a hillside in between shady trees and away from the road. Every bungalow is featured with a spacious terrace to enjoy the spectacular views. Here you can enjoy the tranquility and recharge your batteries in the green. 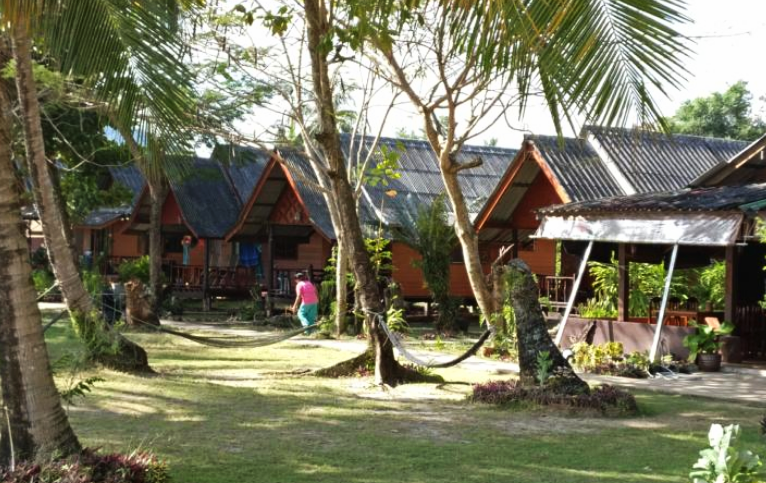 A nice place to stay directly at the beach with simple bungalows, hammocks and the occasional hornbill. 'Suntisook' is derived from the Sanskrit and Pali language 'Shantih' and means peace.. Suntisook was one of the first resorts in Tha Khao village. The rooms are clean and all have A/C. Great food, and the best sweets in the village! A recent nice addition is the on-site Sook Cafe. 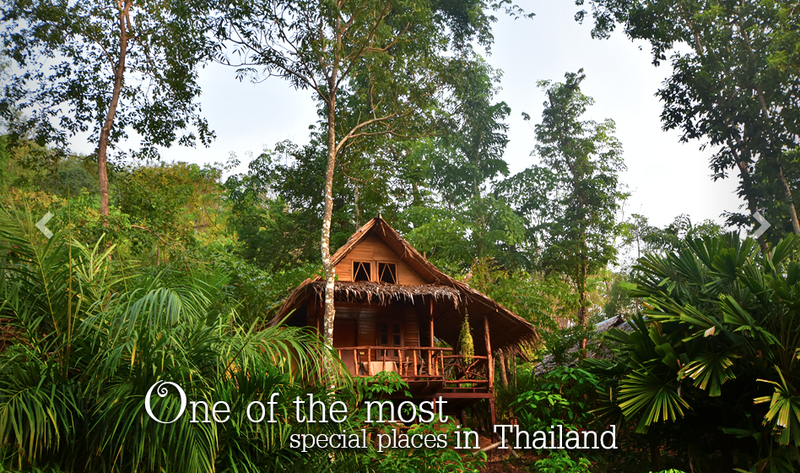 The bungalows are situated on the path which leads to the local water fall (Namtok) – one of the village attractions. Namtok has a nice relaxed atmosphere with a few hammocks at the reception area. Staff is very friendly. This resort is right at the beach, you can choose a bungalow facing the sea or with view of the swimming pool. There is also a restaurant. Everything at Niramaya aims to fulfill your desires if you are looking for a mind soothing, health restoring stay with contemporary luxury in harmony with Thai culture & style. The resort is designed in a traditional Thai architectural style which blends graciously into a coconut palm setting. Each villa faces the beach for stunning views over the bay.